It's that time of year to start making final plans for K9Splash! In order for the event to run smoothly we need your help! Over the course of two days, we will need approximately 150 volunteers. 12:45 p.m. to 3:15 p.m. Setup (4) - Help with tent set-up, move tables to the appropriate booths, set up the entrance area, and whatever else we need to do before the gates open at 10:30. 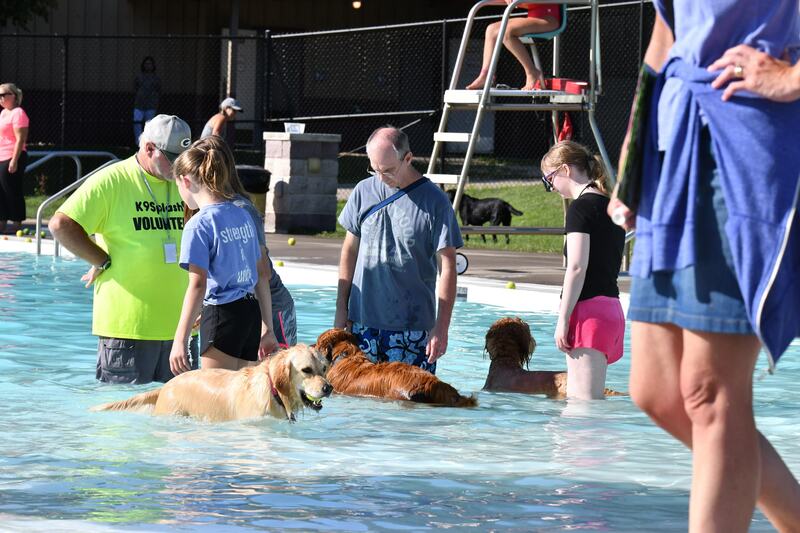 Then move to one of the following assigned locations at 10:30 a.m.
K9COLA Table (2) - Located outside the pool area, this table is responsible for volunteer check-in as well as answering any questions about the two off-leash parks in Cedar Rapids. Registration Table (3) - Take registration forms from individuals who did not pre-register, check vaccinations and take money for entrance fee. Dog Holders (4) - Hold dogs on leashes while the owners are registering and completing any paperwork. Pre-Registration Table (2) - Check in individuals and dogs that have pre-registered for the event. Verify vaccinations if required. Entrance Gate (2) - Verify all dogs have zip ties. Count individuals who enter the gate. Verify that all individuals have signed the waiver. Guard the gate so dogs do not escape. Exit Gate (2) - Guard the gate so dogs do not escape. Hand out goodie bags and thank participants for coming. T-shirt Table in Pool Area (2) - Sell K9Splash! T-shirts and other K9Splash! related items. There is a possibility of getting wet when dogs shake near the table. Pool Walkers (6-10) - Walk the pool area and watch for aggressive dogs. Remind individuals to clean up after their dogs. Remind people not to swim. There is a possibility of getting wet when dogs shake near you. Bathroom Door Guards (2) - Guard bathroom entrances to make sure no dogs escape the pool area. There is a possibility of getting wet when dogs shake near you. Work two shifts - Free T-shirt (if needed), plus one free admission for your dog to the event. Work three shifts - Free T-shirt (if needed), plus one free admission for your dog and a coupon for a free sandwich, chips and drink from our Hy-Vee vendor. The K9COLA Board wishes to thank you for your continued support of K9Splash! whether you volunteer or just come and enjoy the day with your dog!